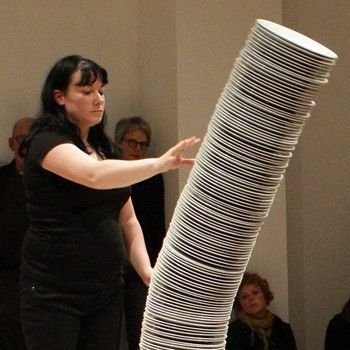 There are three women working in the space, picking up plates, sorting them, stacking them. They are all dressed in black, and switch roles and actions, passing them between them, as one stands in place to steady the stack and the others build. Sinead O’Donnell has made version of this work in the past as a solo durational performance. O’Donnell is one of the three, but there is no distinction made. She tells me later that the other women worked with her in a workshop through a chunk of the previous day, and that it made sense for them to make this piece together, emerging from the shared input, shared work they had carried out. They move quietly, crossing the space, checking in with each other by glance and nod. They share some quiet words, and continue, working. 2:58 PM – 17 Feb 13 #IBT13 #SineadODonnell – the stack is to her eyes, she holds it gently about half way up; it is a different woman standing now; head turned // – there is a cracking noise from within the stack, she adjusts her grasp, turns her head back, looks down eyes soft // – a creaking from the pile of plates, she shifts her arms again, her cheek against the rim of them, looks out and up // – she turns her right foot, eases her weight to the pile, her fingers feel their edges, slide round and down. This is demanding, and requires concentration, this activity. The plates are heavy, and maintaining balance, keeping upright, holding on, requires effort, thought, bodily adjustments and shifts and tilts. These women are engaged in labour, and I am conscious of this as work, as an extended activity, of sorting, stacking, tidying, making well, retrieving the good bits from the debris. There is a sense of this as women’s work, a work of surviving within an environment where the threat of violence is present, where holding still, hardly breathing, walking on eggshells, is the response needed to avoid the crash of a violent partner. Where the constant effort of listening and watching for the signs of cracking, of impending explosion drains her of energy, of life. And there is something beautiful in this too, the figures, dark against the bright room and the pale plates, crossing and bending, and standing. And there is care in the selection of plates, in the cradling of the stack, in the relationship of the standing body to the tower, as the plate edges take the body’s curve, or swing away in a counter weighing. And as the floor fills with fragments they angle against each other, and jut up, and sharp points poke out of the scree of bits. And in my momentary shift into art thinking I meld together two references, one to the Caspar David Friedrich painting, ‘The Wreck of Hope’, which was my first thought, the image of shattered ice, crags and shards poking into the pale sky, and a ship crushed within the mess. And into this I mistakenly mixed the Gerard Manley Hopkins poem, ‘The Wreck of the Deutschland’ which describes another nineteenth-century shipwreck, not in ice fields, but in a snowy windswept North Sea. And yes these both seem too grandiose for this scene, this place, so perhaps the domestic disaster of thrown plates, thrown in anger or in despair may better fit. O’Donnell lies among the shattered plates, in and under them, as the others place bits around her, to cover her head, to gather round the prone body, awkward, face down, and carefully put another bit against her knee, or hand. Her breathing causes little movements within the bits, a piece slides, and the audience watch, listen, intently. Something of this is restful, the lying body is quiet, but it does not seem at peace, as O’Donnell remains somehow tense, holding herself oddly, not relaxed and meeting the floor, but clenching her skin away from the sharp points and edges. So when she stands, the shards dropping away from her, it is a relief for the watchers. The empty area of floor revealed as she moves off remains as a jagged outline of the body, a hole in the jumble of bits. The room settles into something calmer, but with the memory of the crashes that produced this slew of shattered crockery. 5:57 PM – 17 Feb 13 #IBT13 #SineadODonnell – we sit in the quiet, i resist an urge to sort the fragments, by shape or by size, i take a very small one to keep.